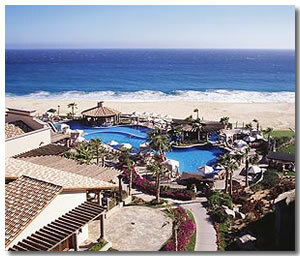 The Pueblo Bonito Sunset beach in Cabo San Lucas is a Pacific Ocean beach resort. It's location is in a secluded part of Pedregal de Cabo San Lucas. Surrounded by the villa community you are on the quieter side of Cabo San Lucas. You have stunning Pacific Ocean views from every room at the Pueblo Bonito Sunset Beach. The perfect view to wake up to while on your Vacation on the tip of Baja California. A complimentary shuttle service is available to transport you around the resort. It also takes you to the partner resorts. These are the Pueblo Bonito Rose, and the Pueblo Bonito Los Cabos Blanco. They are both situated on Medano beach where it's safe to swim. You have a choice of over 320 guest suites all within 28 buildings set in the hillside next to the ocean beach. You can relax out on the balconies, or if you're on the ground floor you get a nice terrace to have your breakfast, or laze away your afternoon. You have air conditioning in the rooms as well as a ceiling fan to cool you off after your day in the sun. The beds are comfortable, cushioned featherbeds that give you no trouble in getting to sleep. You have a choice of pools at the Pueblo Bonito Sunset Beach in Cabo San Lucas. The largest is by the beach which has 2 levels , and a swim-up bar. The other pool which is closer to the beach has an infinity edge. There are another 2 pools situated up in the hillside. They also have a children's pool, and a spa tub with them. The ocean views are a much better from the hillside pools, and are a bonus if you don't mind being away from the beach. La Nao - This is a fine dining restaurant that has air conditioning and an ocean view terrace. You have À la carte menus, and themed buffets during the week. There's also a pianist that plays while you're eating during the evening except for on Mondays. This is a smart dress only restaurant meaning long pants, long sleeved shirts, and closed toe shoes for men. Reservations are also required. La Frida - This is another fine dining restaurant which has more Mexican cuisine on the menu. the restaurant features an ocean-view terrace for those warm evenings. It's another smart dress only restaurant, and reservations are also required. The Bistro - This is your casual restaurant. No need to dress to impress here. You can just relax and do what you came for, and that's eat. Although casual it still has a good menu of seafood, chicken and steak dishes. If you do feel like going out for a meal you are not far from downtown Cabo. There's plenty there to keep any type of athlete happy. That's if you get the time between your relaxing. A Cabo car rental is only necessary at the Pueblo Bonito Sunset Beach in Cabo San Lucas if you plan on leaving the resort a lot. You have the complimentary shuttle service that takes you to the partner resorts. You will only need a car rental if you plan to travel into town a lot or to Medano beach. If you enjoy your secluded areas you will have no need to travel out of the resort. You can relax and enjoy your Cabo San Lucas vacation.